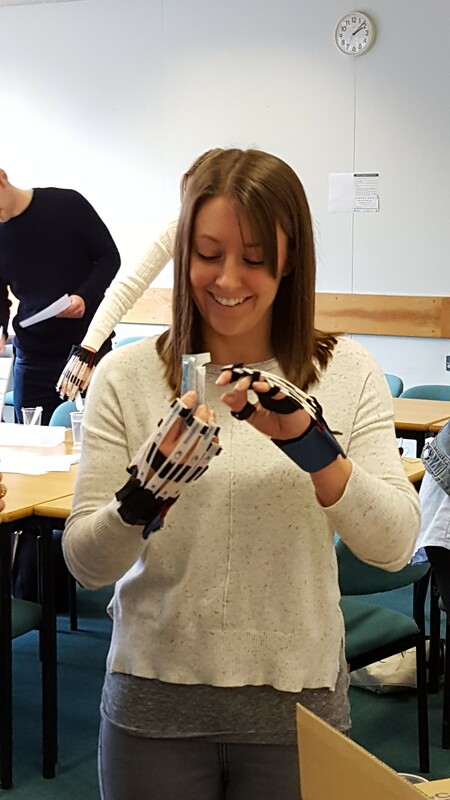 Speech and language therapy (SLT) students took part in an experiential learning session today, with activities that were tailored for their professional training. The activities were designed to enable the students to gain insight into how a range of impairments and conditions may affect people in everyday activities, and also to have experience of how other people’s impairments may impact their role as SLTs. With their dexterity impaired, students were asked to fill a plastic cup full of water and stir a sachet of thickener into it – as SLTs, they may often interact with people with swallowing difficulties who require thickened drinks. They were asked to administer a speech and language assessment to somebody whose vision was impaired, and then to undertake the assessment with their own vision impaired. 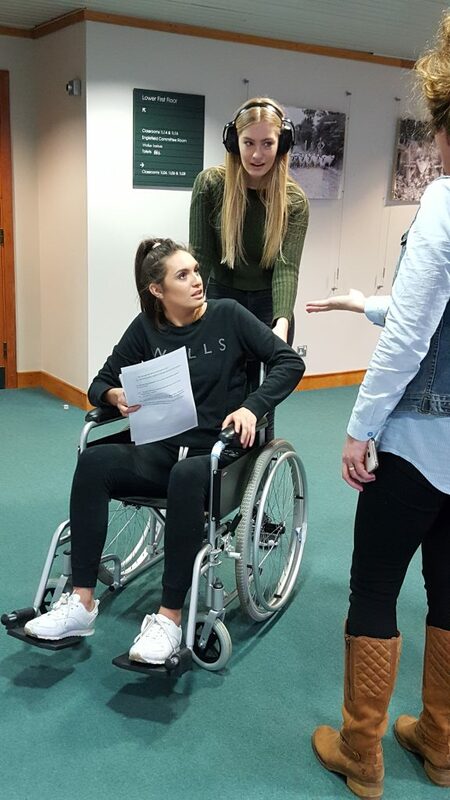 Students were asked to have a conversation, with one person sitting in a wheelchair and the other pushing the wheelchair whilst having their hearing impaired. 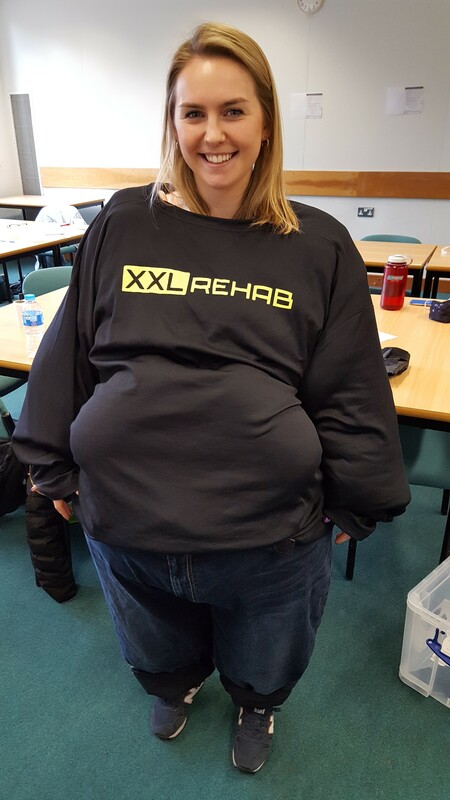 Students also carried out activities whilst wearing bariatric training suits or ageing simulation suits. 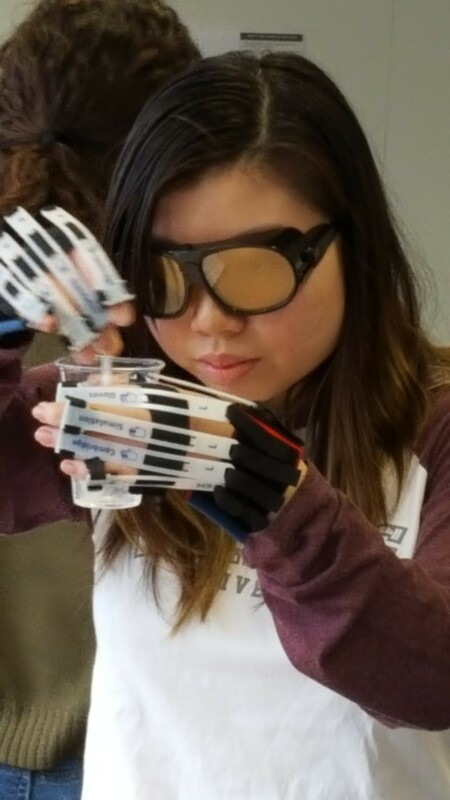 Student feedback highlighted that they enjoyed the interactivity and the opportunity to try a range of equipment. They also liked that the activities were SLT-focused. Thanks to all the students for their enthusiastic participation! Much credit is due to Melissa Loucas (Clinical Tutor) for designing the SLT activities and leading the workshop, and to Allie Biddle and Mirjana Sokolovic-Perovic for their support today and for their instrumental roles in making this workshop happen. 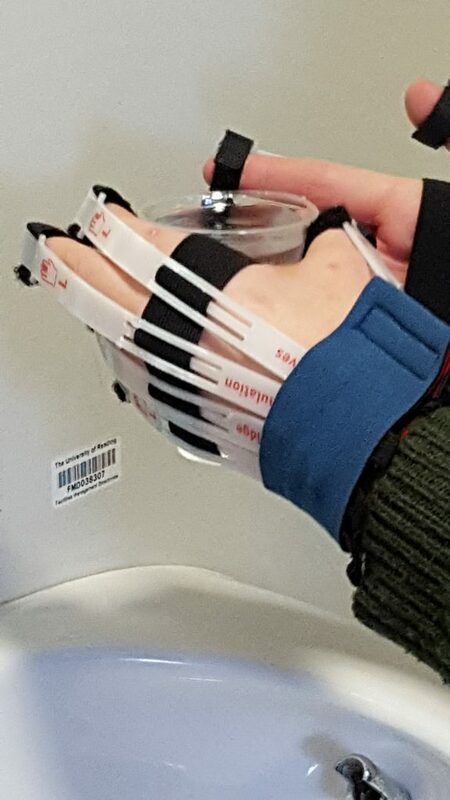 Carrying a plastic cup full of water while wearing gloves which simulate dexterity impairment. Trying to open a sachet of thickener with impaired dexterity. Trying to dissolve thickener into a cup of water with impaired dexterity and impaired vision. 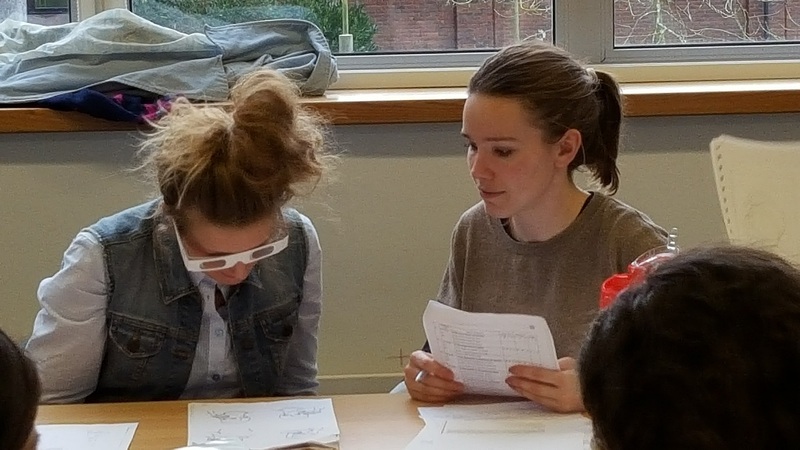 One student administers a speech and language assessment to another who is wearing vision impairment simulation glasses. Experiencing how different body positions and different impairments can affect conversation. Trying on a bariatric training suit. 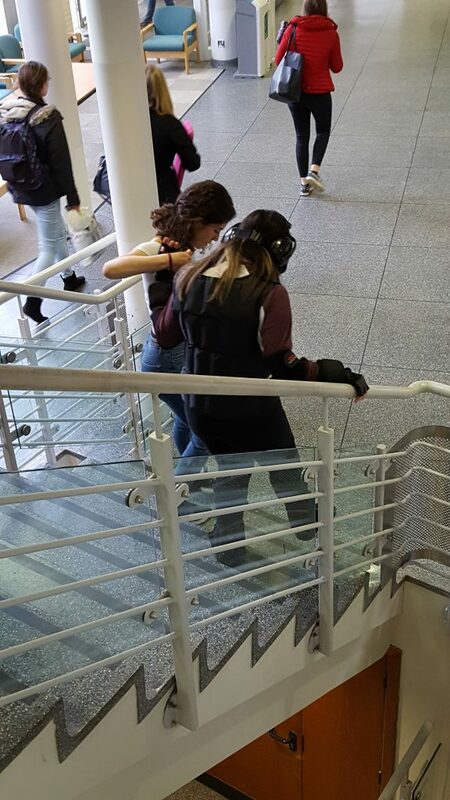 Being helped down the stairs whilst wearing an ageing simulation suit.